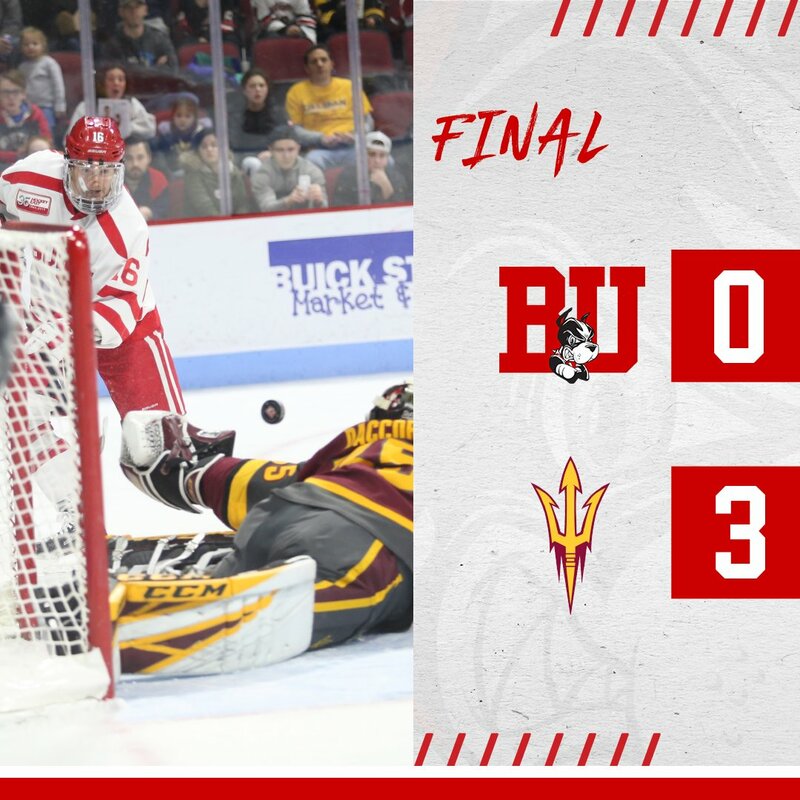 Freshman Vinnie Purpura made his Terrier debut in goal last night, but it was Arizona State netminder Joey Daccord who made the biggest statement, stopping 28 BU shots en route to a 3-0 win at Agganis Arena. The Sun Devils got a pair of goals from Johnny Walker, the leading goal-scorer in Division 1, who now has 21. Unlike Friday night’s BU win, Arizona State used its size and physicality to negate the Terriers speed and consistently broke up entry passes. The first period was scoreless with the best scoring chance coming off Max Willman’s stick close in. But Daccord made a 4-star save. Early in the second period, ASU capitalized on a 3-on-2 rush with trailer Filip Buncis rifling a shot past Purpura from the the high slot. The visitors doubled the lead in the final minutes of the period when Walker eluded a BU defender and redirected a blue line slap shot behind Purpura. In the third period, Walker controlled a rebound in the right circle and whipped a sharp-angle shot home for the 3-0 final score. Despite the loss, Coach Albie O’Connell was pleased with Purpura’s performance, noting: “Our goalie was our best player. It was a really good effort by him. Zegras puts the U18s ahead, 4-1, with his second goal of the night. 2019 recruit Trevor Zegras score twice in the NTDP U18’s 4-1 win against Muskegon. Fellow recruits Alex Vlasic and Dominic Fensore assisted on Zegras’ second tally and Vlasic added another helper as well. 2019 recruit Robert Mastrosimone scored his 15th and 16thgoals in Chicago Steel’s 7-2 win against Fargo. Doyle is perhaps the best puck handler on the blue line in all of prep hockey. When he is involved offensively, Lawrence is tough to defend. Really talented player. 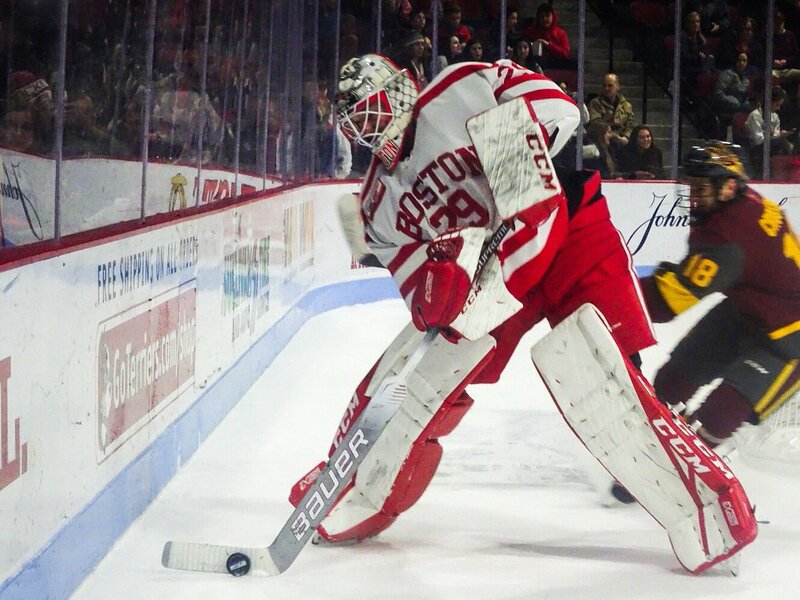 #10 Terriers and Merrimack played to a 3-3 tie at Lawler Rink in North Andover. BU, which had a 2-1 lead after the first period, on goals by Kristin Schuler and Abby Cook, fell behind as the Warriors scored early in both the second and third periods. With just over a minute remaining in regulation, Sammy Davis scored an extra-attacker goal to knot the score at three apiece.